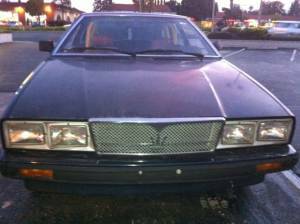 The ad states: "1985 Maserati Biturbo S. The body and interior are in very good condition,only has 97k miles on it, 5-Speed transmission, 2 door, leather seats, suede headliner, power windows, twin turbo, roll cage bar... 1,800 OBO"
I'm not sure this is an "S" (or ES), which differed from the standard Biturbo by having a stiffer suspension and a few interior upgrades. Most "S" cars I've seen were two-tone, usually red over gray. As long time readers know, I'm a huge fan of these often maligned cars. They're not perfect. They need regular, often expensive, maintenance. But, if you're willing to put the time and effort into one, the Biturbo will reward you with near-supercar performance and luxury for just a tiny fraction of the price. 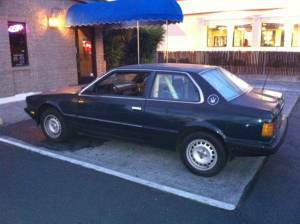 Located in Redwood City, CA, click here to see the Craigslist ad.